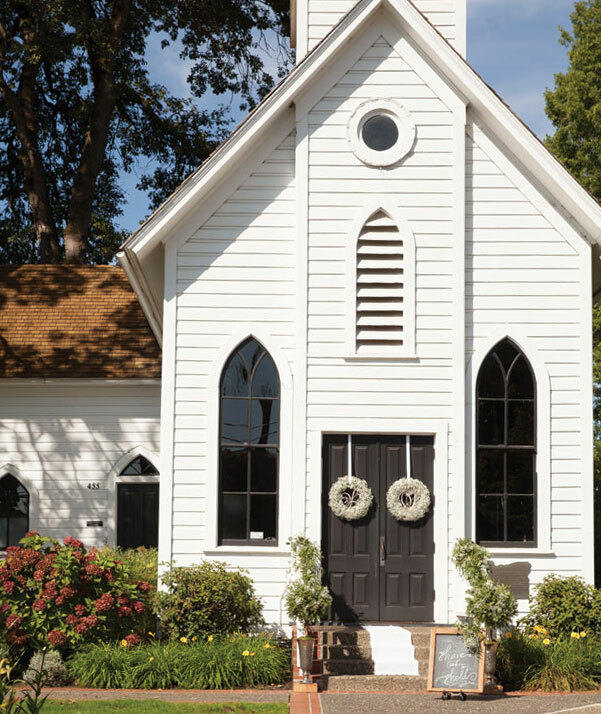 (above) Barged down the Willamette River from Milwaukie in 1961 to its current Sellwood location, Oaks Pioneer Church dates from 1851 and is the oldest intact church building in Oregon. It’s also a favorite spot for sweet, intimate weddings and photo ops. Flower wreaths and swags by Lucy’s Informal Flowers in Hood River. Personalize the church entrance with laser-cut birch initials ($75 from Puddle Jumpin’ Cards) and a chalkboard sign from Riverhood Rentals in Hood River. Seersucker napkins and biscuits recall southern hospitality but a signature whiskey cocktail and fresh Hood River strawberry jam? Definitely Oregon. 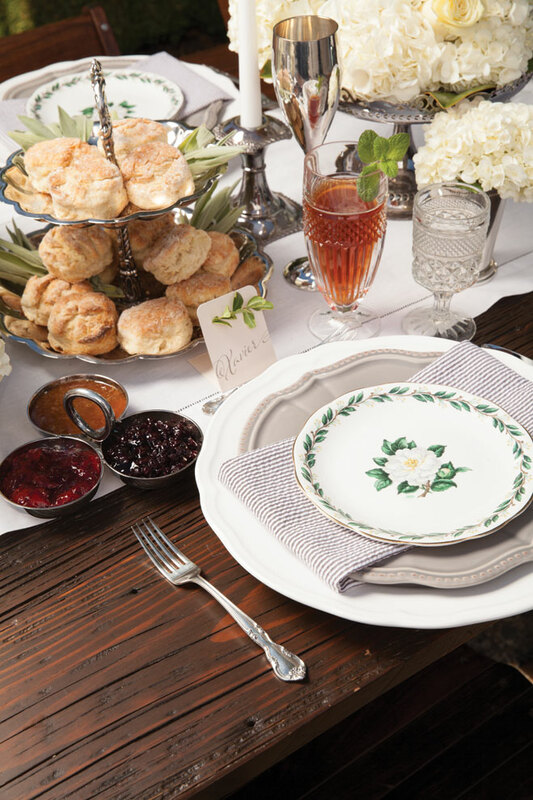 Dinner and salad plates, napkins, goblets, candleholders, glass cake stand, runner, table and chairs from Riverhood Rentals. Small plate, flatware and silver stand from Adornments of Hood River in Hood River. Bouquets of ivory hydrangeas by Lucy’s Informal Flowers. Biscuits with homemade jellies from Boda’s Kitchen in Hood River. Place card from Puddle Jumpin’ Cards. 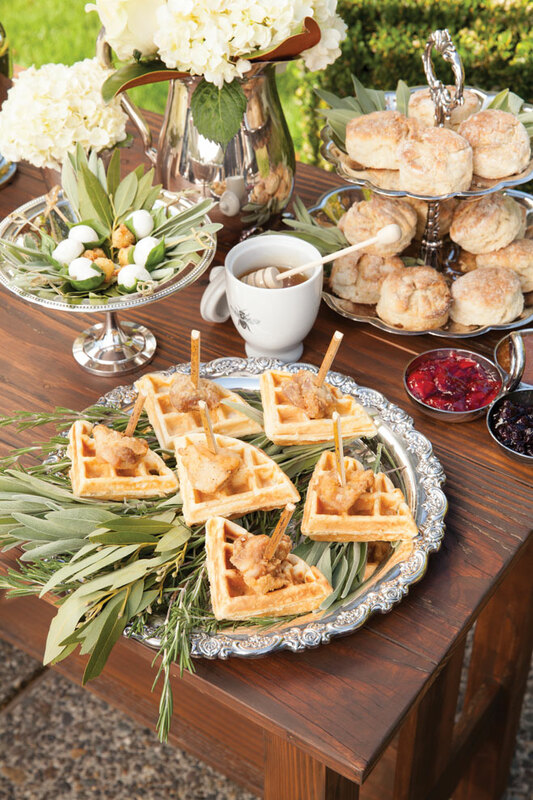 Boda’s Kitchen chef, Sirota Johnston, dreamed up a south by northwest menu of hors d’oeuvres that includes mini chicken and waffles accompanied by fried green tomato caprese skewers. Drizzle the whole thing in Oregon honey and guests will swoon. Serving trays and accessories from Riverhood Rentals. Silver pitcher and biscuit serving tray from Adornments of Hood River. 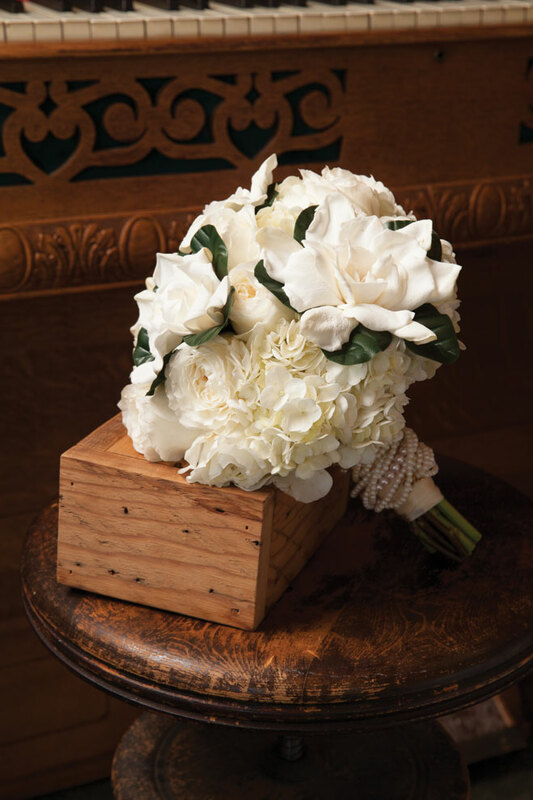 Tied with a string of heirloom pearls, an ivory bridal bouquet designed by Lucy Gorman—the namesake behind Lucy’s Informal Flowers—combines hydrangeas, garden roses and gardenias for a timeless arrangement. 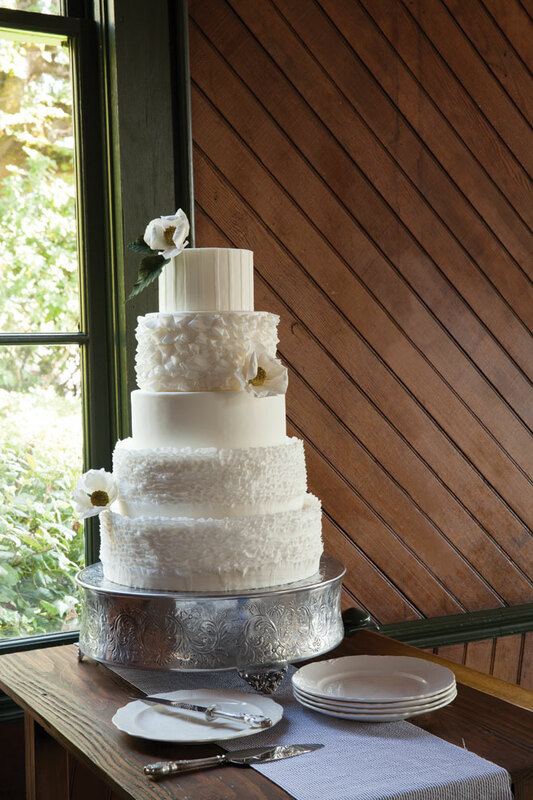 A five-tiered masterpiece with fondant textures ranging from frills to ruffles to stripes has dreamy written all over it. Salem’s Country Cake Shop owner Sara Stringer creates these delicate desserts—and the sugar flowers—with the eye of a fine artist. $4 per slice, $400 minimum order. Silver cake riser from Adornments of Hood River. Hitched in the Hood event coordinators put a spin on a southern staple, hot boiled peanuts by wrapping up candied Oregon hazelnuts in a handmade seersucker bag. 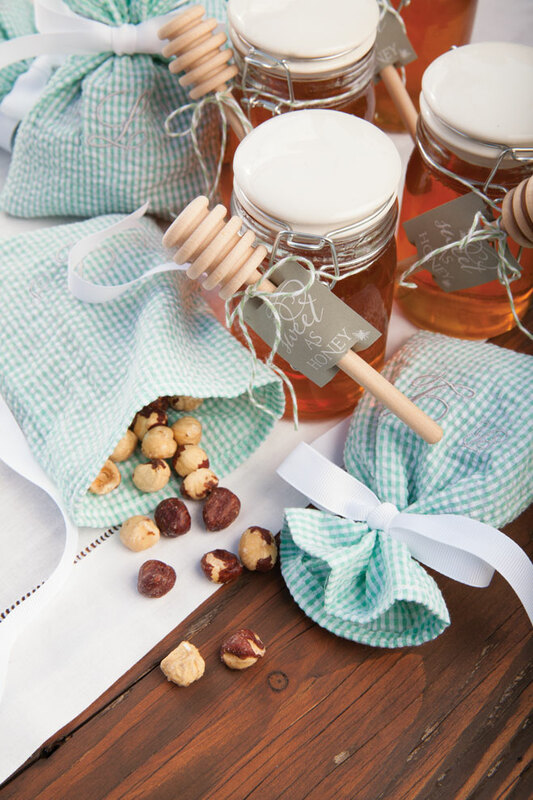 Make the send-off even sweeter with a jar of honey and hand-lettered sentiments. Favor tags, $2.50 each, from Puddle Jumpin’ Cards. 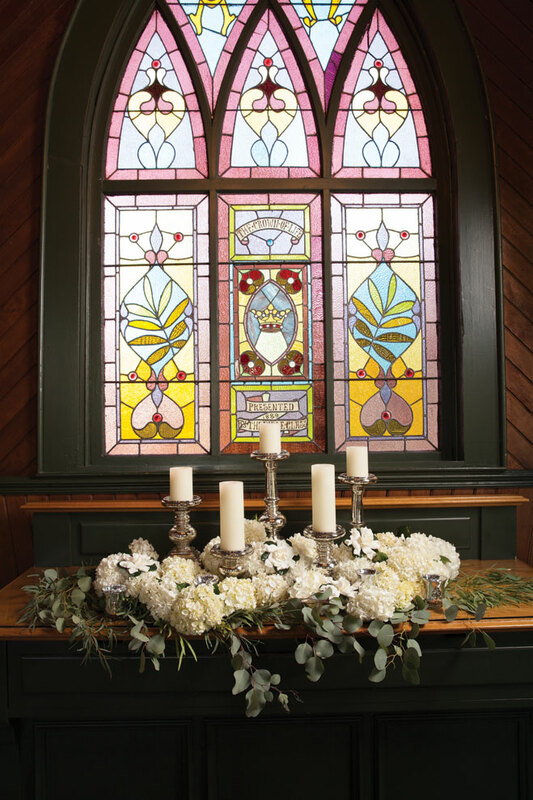 A simple display of candles, hydrangea, eucalyptus and roses decorate the altar and allow the golden and lavender hues of the church’s circa 1889 stained glass window to fill the space. Flowers from Lucy’s Informal Flowers. Candleholders from Riverhood Rentals. 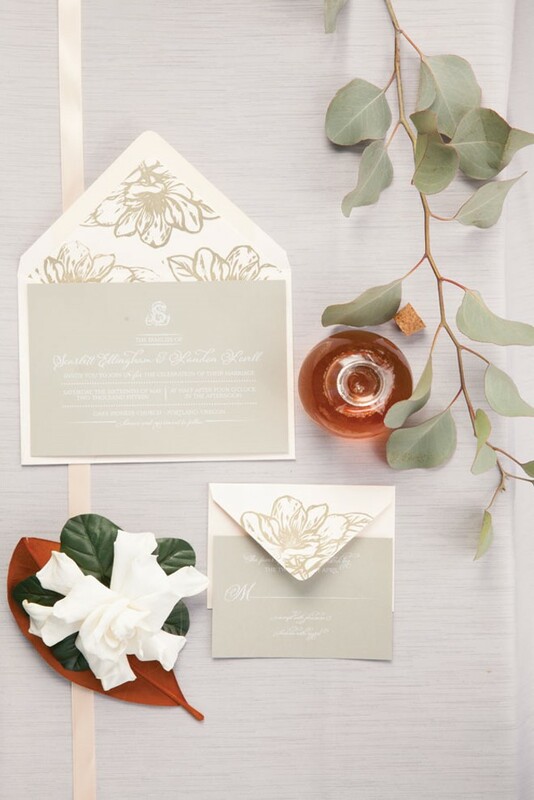 Designer Sunny Sisson of Portland’s Puddle Jumpin’ Cards created this invitation suite using both traditional (hand block printing) and current (white ink printer) technologies. The result is an elegant mix of old and new. Suite includes invitation, RSVP card and hand block-printed envelopes with printed return address, $11 each. Custom hand-carved block prints start at $200.